Over the last twenty years, ergonomists and safety professionals have been highly successful in reducing the frequency and severity of workplace injuries across several industries. Though the employee front observed marked success, safety and human resources professionals are struggling with large workers' compensation claims with high temporary total disability payments, causing havoc to their safety performance metrics, OSHA Logs, and insurance program loss ratios. Triggering these issues are the growing prevalence of health issues such as obesity and diabetes that exacerbate musculoskeletal disorders such as low back pain or carpal tunnel syndrome, and lifestyle behaviors, such as smoking, that delay the recovery and increases lost work days for when a person is out with a worker's compensation claim. With this undeniable relationship between health and worker's compensation costs, executives and leaders at companies are now expanding their attention to target health to influence claims both on the health insurance and on medical claims front. This paper highlights a case study where a mechanical contractor expanded its safety culture to include a focus on wellness to maintain their history of flat Workers' Compensation Insurance renewals and reign in their annual healthcare increases. In fact, healthcare claims costs are at a level nearly 50% below national average. The benefit of experiencing a per employee per month (PEPM) rate of $400 less than the national average and net healthcare increase of just under $40 PEPM over a seven year period has enabled the group to expand their wellness offerings including an onsite fitness center, onsite fruit delivery, and other environmental and cultural interventions. The 2012 Bureau of Labor Statistics (BLS) report shows incident rates for occupational injuries in the construction industry have decreased by over 60% in the last 18 years (11.8 per 100 employees in 1994 to 3.7 per 100 employees in 2012). Many companies have succeeded so well on their safety cultures that they aim to achieve a Zero Incident Culture. Results for these companies reflect not only a reduction in injury incident rates, but also the costs associated with lost workdays and impairment awards from catastrophic injuries have decreased. However, despite a decrease in the frequency and severity of workers' compensation claim, the medical costs of incurred claims continue to increase and in fact have taken over the largest component of the cost of a typical workers' compensation claim. In fact, in 2012 the National Council on Compensation Insurance (NCCI) reported that the average lost time claim had $28,500 in medical expenses versus $22,400 in lost wages expenses (Figure 1). Even further, when analyzing past workers' compensation claims from 2000-2009, the NCCI found that the number of claims with substance abuse quadrupled while claims with comorbidities such as obesity, diabetes, and hypertension had tripled. With the reality of the impact of an employee's health status affecting the costs of a worker's compensation claim, the necessity to partner efforts with wellness programs is undeniable. As employers look to achieve such impressive outcomes, certain elements have been identified to contribute to obtaining this success. As identified by the Construction Industry Institute (CII, 2013), key factors for a positive safety culture include management commitment, staffing for safety, project pre-planning, safety orientation and job specific training, employee involvement, evaluation and recognition, subcontractor management, accident investigations, and substance abuse testing. The construction firm selected for this case study is located in the western region of the United States with nearly 150 employees working within the state and neighboring ones to that of their two main office locations. The company is a contractor who designs, fabricates, installs and maintains heating, ventilation and air conditioning equipment for commercial buildings. They also design and install process piping in the chemical industry. Currently their annual revenue is over $50 million and they are a non-union contractor organization. Ever since their inception ten years ago, the company has had a strong safety program, with executive leadership viewing safety as a core value. Safety orientation occurs for all new hires, trainings occur at least monthly along with daily job safety analysis and briefings. Performance reviews take into account safety at the employee level, and supervisors are held accountable for safety outcomes on their job. Pre-employment testing occurs for employees, and if an injury occurs while at work, a designated medical clinic is utilized where the company is actively involved in modified duty placement and working with the employee during the return to work process. At the same time, the safety director, supervisors and leadership team are all involved in the accident investigations. 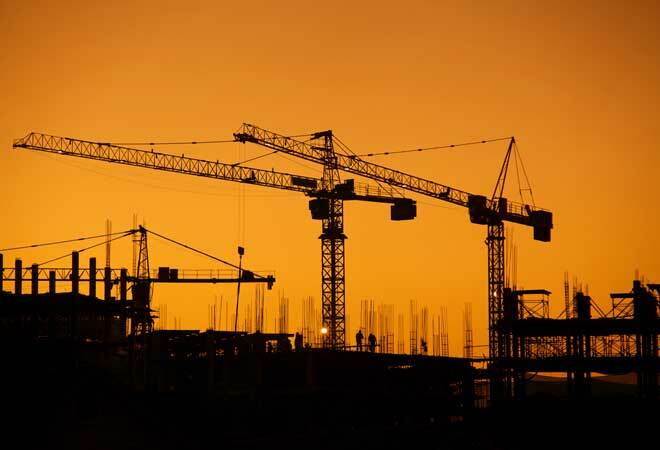 The contractor's safety program is prominent on their website and has allowed them to earn preferred status with some of the largest local general contractors. The impact of the strong efforts of the safety culture at this client is evident in their tracked worker's compensation outcomes. The annual number of claims for this contractor has decreased 80% from 26 in 2008/2009 to a low of five in 2012/2013. The associated Experience Modification Factor has also decreased from 0.80 in 2008/2009 to 0.70 in 2012/2013. Since 2007, the client took a focus on wellness and engaged with Life IQ, the health risk management practice within their benefits broker. Once engaged with Life IQ, in tandem with the benefits team, a cohesive strategy was put into place that integrated plan design and health promotion to achieve the client's desired goals. With particular respect to the wellness initiatives implemented by the present client, a marked increase in wellness related programming and efforts have taken place over the past few years. Initial efforts began in 2008 and consisted of an onsite health fair and fitness center reimbursements. As the client has realized the importance of wellness to their company's performance, so too has their budget and allocated staffing time increased to conduct a wellness program. In 2013, the client took a large step forward and launched a comprehensive wellness portal that integrates electronic devices with gamification to engage the company population on health efforts. Subsequently, over 60% of their population enrolled into the portal, and within those enrolled, an impressive 61% were continuing to exhibit active engagement months later on the portal. Within the construction industry, engaging employees can be a challenging feat since many employees work remotely in the field. The strong culture that the CEO has built around the importance of health, along with a strong core wellness committee, has helped mitigate what traditionally can be a very difficult population to engage. In 2013, 46% of employees completed a Health Risk Assessment (HRA) and 58% of the population completed a health screening. What is noteworthy here is that the incentive to employees was $50 for completing the two items that is markedly below the current industry mean of $594 (Fidelity, 2013). Couple that with the fact the client is at or above benchmarking norms for participation (Rand, 2013), and the impact of their company culture surrounding health is evident. When exploring more deeply the results of the screenings, particular health risks have become areas of focus. In 2012, the client observed 73% of their screening participants had elevated blood pressure (Figure 2). As a result, programs, seminars and communication pieces targeting blood pressure and factors that influence it, were put into place for that year. These efforts indicated a positive impact with a nearly 20% reduction reported in 2013. Though this has declined in the past year, it is still a high risk, and environmental changes are in the works for 2014 such as providing onsite blood pressure screening cuffs along with strengthening the tobacco free policy enforcement and financial value of the tobacco free incentive. 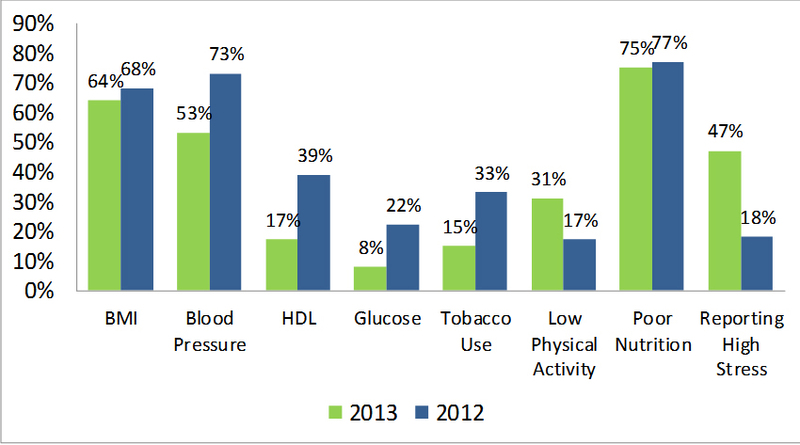 Although several positive changes were observed related to areas of focus in 2012, not all health risks improved in 2013. Reported stress level and low physical activity were noted to increase negatively for the population. As such, in 2013 a strong focus was placed around improving activity levels by launching the electronic tracking device, promoting the Race for the Cure event and more. The efforts on wellness are dependent of a focus with the health plan. Education to the employees relies on the fact they are self-funded and that a healthier population has the potential to reduce claims costs and thus the costs to employees. Even further illustrating this cause and effect relationship, if the health plan runs below the set expectation spend at the end of the year, the employer has pledged to provide a bonus back to the employees for their contribution to the success of the plan and appropriate use thereof. From 2007 to 2014, the PEPM healthcare spend has increased just shy of $40 while the industry has typically experienced around 5-10% increases each year, equating to upwards of $300 PEPM. Although the plan felt a strong impact, this was primarily due to several large acute claims that were independent of lifestyle and will happen to a company over time. This impact righted itself in 2014 and shows in the maintained low PEPM heading into their seventh year. When looking to the future, the focus of wellness is continuing to become more critical to the core of the company. As they merge with another company there will be uncovered risks of this population that may shift the focus of wellness efforts from where they currently stand. Nonetheless, the intention in the years to come is to continue to expand the bond between safety and wellness, increase the expectations of managers to participate and promote health to their employees, change the environment and policies to facilitate health, and continue the movement towards additional health-contingent accountability standards. 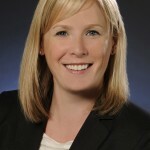 1 Account Executive - Life IQ - IMA, Inc.
2 VP/Director - Risk Control � IMA, Inc.
3 Account Executive - Benefits - IMA, Inc.
4 Risk Control Advisor � Risk Control - IMA, Inc.
Lise has over eight years of experience working with employer groups to develop tailored strategies founded in data analytics to promote well-being at the worksite.� Lise received her bachelor's from Colorado College, an MS in sport psychology from Florida State University and an MPH in health promotion from Oregon State University. Kaiser Family Foundation and Health Research & Educational Trust (2013). Employer Health Benefits: Annual Survey.